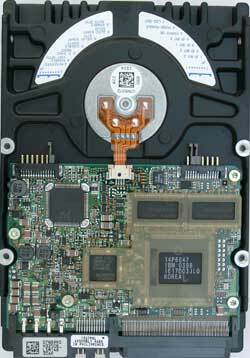 We haven't reviewed SCSI drives since November last year. Moreover, it is being discussed now whether such reviews are topical at all. That is why if you have pros or cons such reviews of SCSI drives or comments on how they should look like, please, send them here. In my opinion, people buying SCSI drives are well aware of what tasks they are going to be used for, that is why such reviews should contain less analeptics and more facts because competent users are able to draw conclusions themselves. But all your suggestions are welcome. Well, this review is supplemented with "unfiltered" Intel IOMeter results. It is possible that some people are interested not in average but in the maximum response time etc. 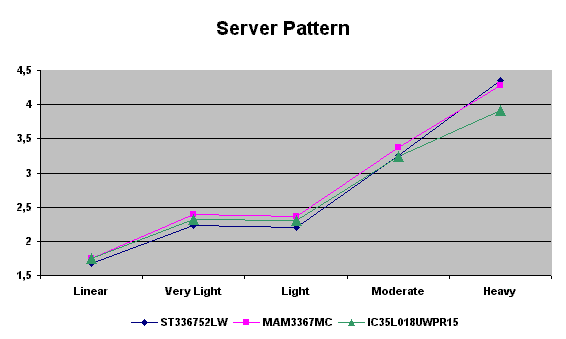 The drive will be compared with 15,000 models reviewed last time - a model from the Seagate Cheetah X15 36LP line: ST336752LW and one from the Fujitsu MAM3xxx line: MAM3367MC. Below is a table of the specified characteristics of these lines. The IBM's model doesn't look impressive as compared with the contestants - it yields to them in almost all parameters except the seek time of the 18GB model. But, as you know, each manufacturer has its own technique of measuring parameters, that is why let's turn to the tests. For the Winbench the drive had one partition of FAT32 and NTFS. For other programs all information on partitions was deleted. The Winbench and HDTach tests were fulfilled three times and the results were averaged. Time of operation of one template for each load in the IOMeter was set to 10 minutes. 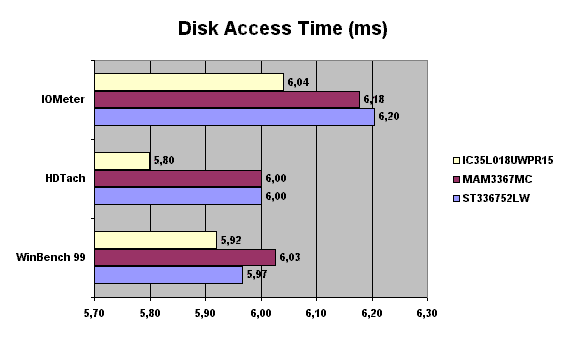 All three tests were used to measure the access time. 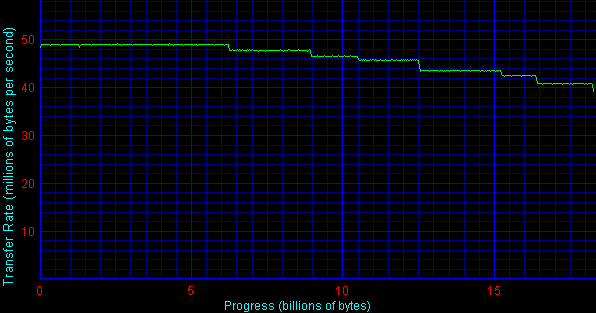 In the IOMeter test we took the Average Response Time for the 100% random read template at Queue Depth equal to 1. On the whole, the results coincide with the specs - the IBM is ahead. 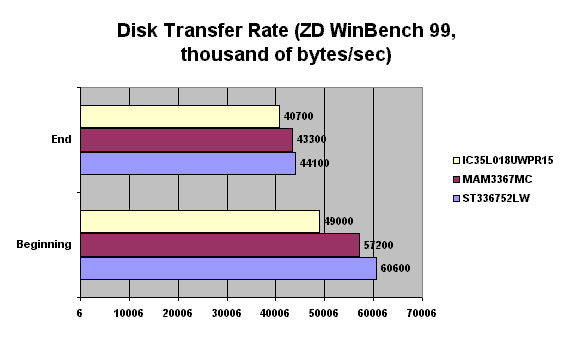 The ZD WinBench 99 test gives results closest to the specs. The HDTach provides average results of read/write speeds. Nothing unexpected so far - the IBM falls behind its competitors. 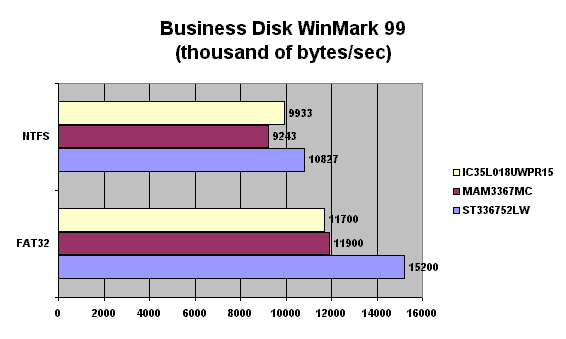 Let's take a look at the linear read speeds at the beginning and end of the disc obtained with the ZD WinBench. Well, it was possible not to use these tests - it was enough to look at data in the table. We got nothing new. 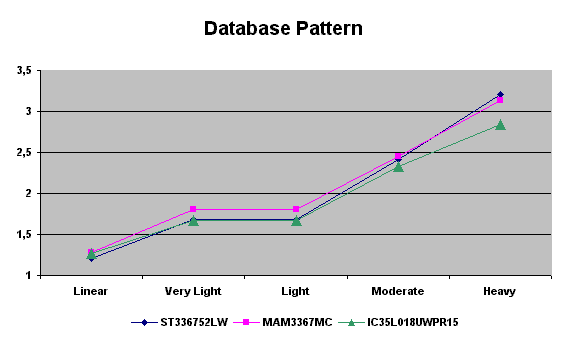 But, still, let me show you a diagram of the linear reading of the tested disc. Well, it's time to turn to more informative tests. With the FAT32 the Ultrastar 36Z15 catches up with the Fujitsu MAM3xxx, and with the NTFS it beats the latter. These results are very similar. 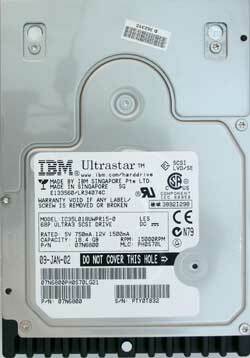 In case of the maximum loads the Ultrastar loses (especially when the Server and Database templates are used). The complete results for the Server, Workstation, Database, Streaming Read/Write, Random Read/Write templates are attached (csv file, Zip archived - 7.818 bytes). Unfortunately, we can't compare correctly the obtained results with the previous ones for this parameter because today even an air-conditioner doesn't help... With the same temperature measurement technique we got 48 degrees C.